European progressives are clear that the EU’s demise would spell disaster for its citizens, and yet, nothing short of a complete transformation can pull it back from the brink. All London photographs taken by Thomas Dedes. 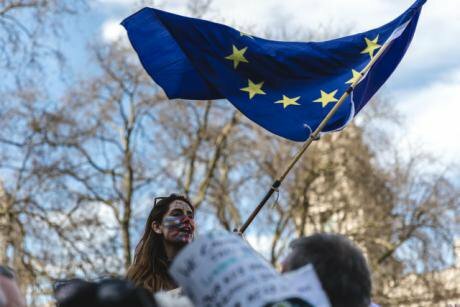 On Saturday 25 March, tens of thousands from across the United Kingdom marched to Parliament Square in London, to protest against the government’s stance on Brexit and the European Union. With less than a week to go before Theresa May formally begins the Brexit negotiations, the #UniteforEurope march acted as a powerful reminder that “the will of the people” is far from clear, and that for many, the implications of leaving the EU are simply too serious to be ignored. Tariff barriers, regulations, single market norms and other European policies may be dry at the best of times, but ever since the referendum campaign last year, more and more people in the UK have become truly knowledgeable about the ins and outs of the EU, and they are under no illusions about the great difficulties ahead. For many protesters on Saturday, the defining feature of Theresa May’s government is an image of sheer incompetence, recklessness and absolute complacency about the implications of Brexit. 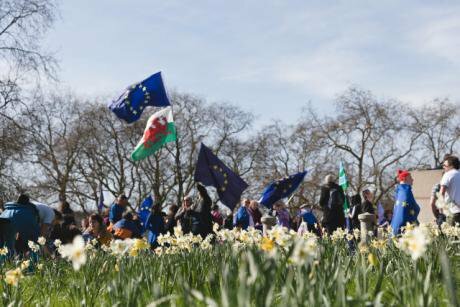 “We believe that it’s a disaster to come out of the European Union, certainly to come out of the single market and the customs union,” said Sue, who came from Southampton for the march. There is indeed a very real possibility that Britain’s current economic relations with the rest of Europe could be severed with nothing to replace them, and if that happens, Sue argued, many of the people who voted Leave may come to regret their decision. But if the UK’s economic future is in doubt, an even greater source of worry is the future stability and unity of the UK itself. “I’m really concerned for the people of Scotland and Northern Ireland. Where does that leave them? I think we’re in such a dangerous situation that the United Kingdom could be broken up,” she said, referring to the current political impasse facing both Scotland and Northern Ireland, both of which voted to Remain in the EU. 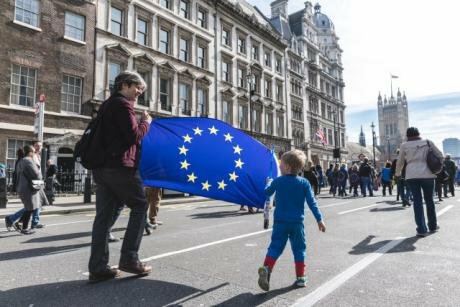 Saturday’s march fell on the 60th anniversary of the European Union, which formally came into existence when the Treaty of Rome was signed in 1957. To mark the occasion, thousands of people from across Europe travelled to Rome, partly in celebration but also to reaffirm their demands for radical changes that are needed to stem the rise of populism and turn the EU into a body that is truly democratic and representative of its citizens. 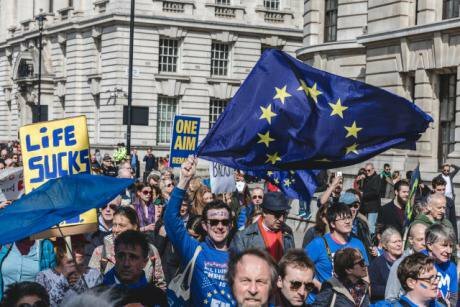 While many very clearly opposed the referendum result as such, others at the march took the view that the only way for Brexit to work out well is if there is a complete change of approach on behalf of Theresa May’s government. “As it stands today it’s going to be a tough challenge for the negotiation to happen,” said Charith from London. “The EU can’t give favours to the UK, because it really encourages additional splits within Europe,” he added, emphasising Theresa May’s apparent determination to steer the UK towards a “hard” Brexit that would see the UK become a tax haven with increasingly low financial regulation. 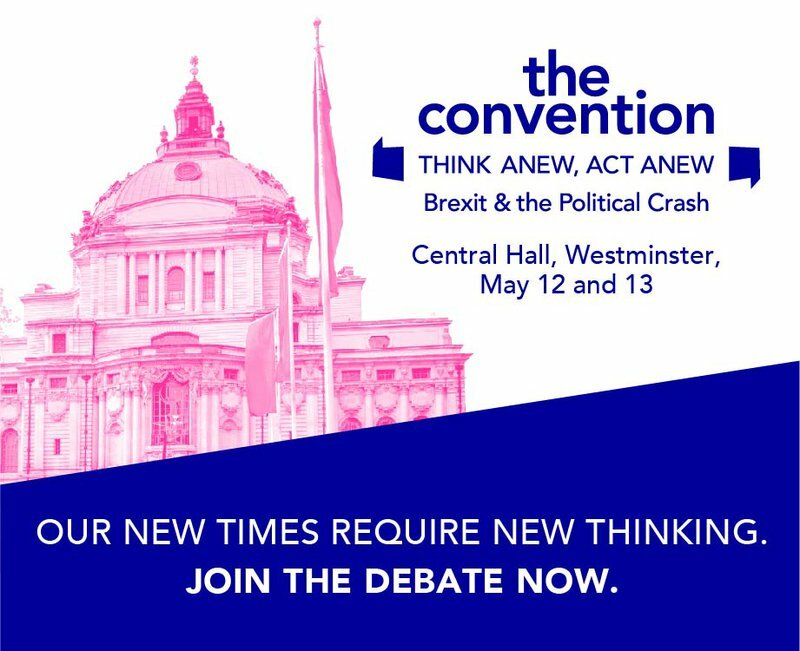 Indeed, if there is one thing that still unites Theresa May’s government and the European establishment, it is the belief that austerity and cuts to public services are the only way of overcoming periods of crisis. While immigration undeniably played a big role in the Brexit referendum, it is becoming increasingly clear that austerity was also a major driver for the Brexit vote. According to research by the University of Warwick, “fiscal cuts in the context of the recent UK austerity programme are strongly associated with a higher Vote Leave share.” In other words, in many parts of the UK there was a direct correlation between the decision to vote for Brexit and the impact of austerity upon public services such as local government and healthcare. As it stands, the EU is also facing up to the toxic legacy of almost a decade of austerity, with rising inequality and resurgent rightwing populism making electoral inroads in many parts of the continent. Groups such as DiEM25 have made it clear from the outset that these problems do not stop at national borders, and neither can the solutions. 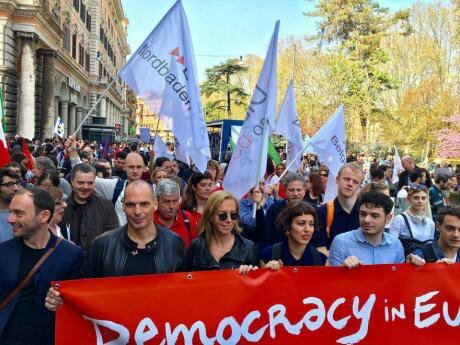 Members of the London DSC joined the march on Saturday, while in Rome, DiEM25 held a weekend of events to present the European New Deal, a bold set of ambitious economic proposals designed to save the EU from itself. The EU has done much to unite member states around a common project, but with major elections coming up in France and Germany, its resilience has never been more in question. European progressives are clear that the EU’s demise would spell disaster for its citizens, and yet, nothing short of a complete transformation can pull it back from the brink.